Microsoft’s co-founder jumps into the billionaire space race with a plane to launch rockets. It’s not just ego: There’s a lucrative new industry up there. When you have the wealth of billionaire Microsoft co-founder Paul Allen what do you want for Christmas? After all, the guy has two yachts, one of them one of the world’s largest, a 414-foot vessel named Octopus (suggestions of a Bond villain) with two helicopters and a 10-person submarine, plus nine mansions on Mercer Island in Seattle and homes in London, France, New York, Beverly Hills, and Hawaii. How about the world’s largest airplane? 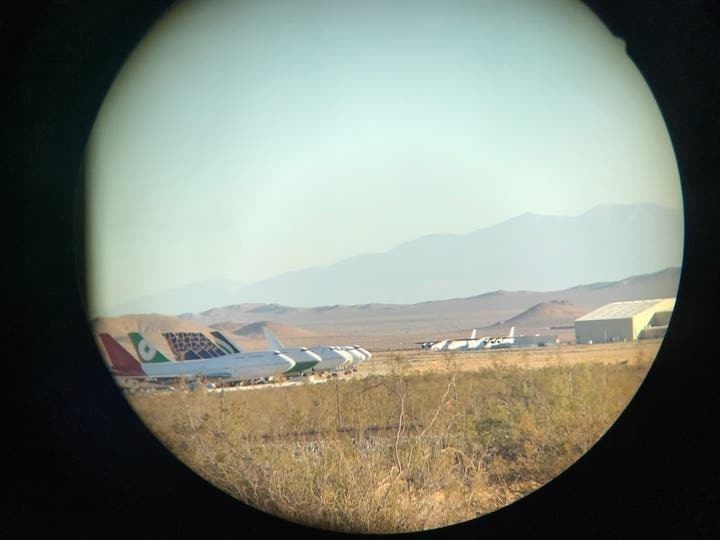 During the last two months the desert around Mojave, California, has reverberated with the deep thunder of jet engines being tested. The Mojave airfield is home to a private collective of aerospace futurists, so the folks who live there are used to the sudden eruption of rocket motors flaring up on short runs. But this was different: recurrent and long runs of multiple jet engines. The engines, six of them, belonged to an aviation goliath, the largest airplane by wingspan ever to emerge from a hangar anywhere. It’s called the Stratolauncher and it’s Paul Allen’s brainchild. As with most trips to the outer edge of what is possible, this project is well behind schedule. But, if Allen is lucky, by Christmas he could be within weeks of seeing his monster fly. This is not a vanity project. It seeks to prove what seems like a very basic premise: that if you launch a rocket into orbit from 35,000 feet instead of from the ground it’s a lot more efficient. It doesn’t require the enormous thrust needed to initially defy gravity and leave a launch pad and so the conventional first stage of a rocket is eliminated. Stratolauncher is designed to launch leaner, lighter rockets that, after being released from the airplane, scorch a path into low Earth orbit where they release not one satellite but a bundle of small satellites. Sixty years after the Russians launched Sputnik, the first satellite to go into orbit, these so-called smallsats are the basis of the next generation of communications networks in space—and, therefore, the basis of a whole new opportunity in the rocket launching business. The speed of change is remarkable. It took two decades to complete the 24-satellite constellation that supports America’s GPS network used by the whole world. Over the next five years at least 500 smallsats are expected to be launched, enabling everything from smartphone connection in places without it across the globe, like swathes of Africa, to real-time constant tracking of every airplane in the sky. Allen isn’t alone in planning to capture a slice of this market. That perpetual dreamer of space enterprises, Richard Branson, has an outfit called Virgin Orbit in California that will use a converted Boeing 747, pulled from the fleet of Virgin Atlantic, to launch satellite-bearing rockets. But Branson’s rockets will be capable of shipping only 300 kilos of payload into orbit, while Allen’s will carry 6,000 kilos. There are other billionaires in the game with their own ideas. The technology of ground-launched rockets has been transformed by Elon Musk’s SpaceX and Jeff Bezos’ Blue Origin. Their major innovation has been re-usable rockets. This has lowered costs and made the market for satellite launches a lot more competitive. However, preparing a launch pad anew after each launch still takes time and the timing of launches is restricted by the relationship between the fixed location of the pads and the limited window for reaching the desired orbit. Air-launching claims two advantages over this: it can be done with greater frequency and from any location in the world where there is a suitable runway. Of course, until Allen and Branson are able to demonstrate that their systems actually work, which won’t be until 2019 at the earliest, ground launches remain the only option. And neither Virgin Orbit or Allen have plans to build more launchers—the Stratoliner, in particular, looks like a one-off. As it happens, there is a clear evolutionary link between the Stratolauncher and Branson’s project. Branson originally intended to pioneer mid-air rocket launches into low Earth orbit using the White Knight motherships that carry his Virgin Galactic space tourism vehicle to launch altitude. Indeed, the Stratolauncher resembles a vastly larger version of the White Knight, which was designed by Burt Rutan, the founder of the Mojave-based Scaled Composites. 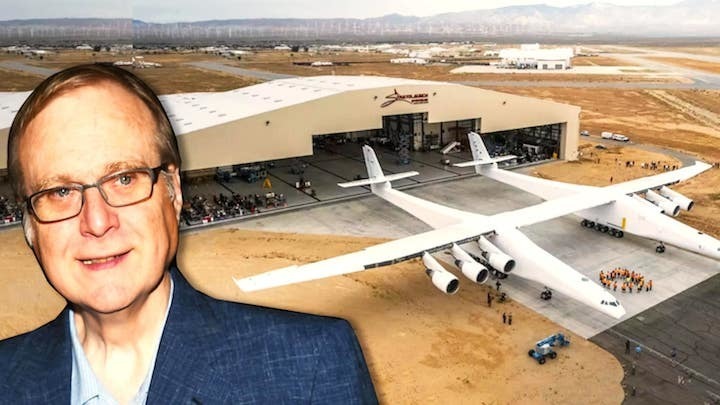 Rutan sold Scaled Composites to Northrop Grumman in 2007 but his influence on the concept of the Stratolauncher, which was built by Scaled Composites, is unmistakable: long, thin wings with two fuselages and the space vehicle slung between them. Unfortunately for Branson’s initiative, White Knight turned out not to be powerful enough to lift the weight of a satellite-bearing rocket—that was why, in order to compete with Allen, he suddenly switched to the 747. Allen, though, had understood from scratch that to meet the demand for launching satellites he needed a purpose-built machine that would dwarf a 747. Nonetheless there is a lot of 747 in the DNA of the Stratolauncher—the engines came from two former United Airlines 747s, as did all 28 of its wheels and many parts of the wings. The empty weight (without fuel and payload) is half a million pounds—the largest 747 model weighs 435,000 pounds. But the world’s largest commercial jet, the Airbus A380, weighs 610,000 pounds. So the bragging rights of actually owning the world’s biggest airplane rest on its wingspan of 385 feet. Its closest competitor by that measure is the Ukrainian-built Antonov Heavy Lifter cargo jet at 290 feet. This is a good time to note that throughout the history of aviation there has been the temptation to equate size with progress, and it’s seldom had happy results. 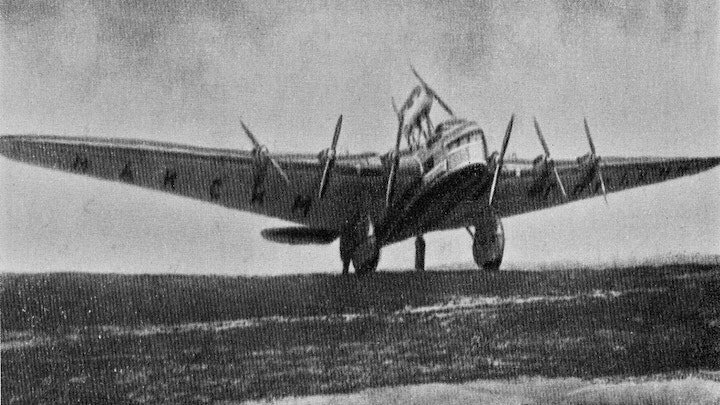 The most bizarre example is the Tupolev ANT-20, created on the orders of Stalin to represent Soviet supremacy in the air, the first one of which flew in 1934, an eight-engine mammoth with a wingspan of 207 feet (a few feet larger than the first model of the 747) named the Maxim Gorky, for the writer exalted for his loyalty to the system. The whole thing was dreamed up as a propaganda exercise by a magazine editor, not as an airplane but as a version of Big Brother in the sky, able to broadcast party dogma through loudspeakers to cities below, as well as carrying its own printing press able to produce 12,000 leaflets an hour, also to be broadcast from above. This enterprise ended disastrously. Although it cast a large shadow, the Maxim Gorky was a lumbering machine with a top speed of only 137 mph. After making 12 flights it took off for a 13th to fly low over Moscow, escorted by two small fighters—the tableau was intended to represent a giant accompanied by gnats. One of the fighter pilots decided to liven up the show with aerobatics. He lost control and sliced through one of the Maxim Gorky’s wings. Both airplanes fell into a suburb, killing a total of 48 people, in the airplanes and on the ground. But among the slender population of aviation’s goliaths one remains both the sexiest and, because of its record the most frustrating: Howard Hughes’ magnificent folly, the Spruce Goose. 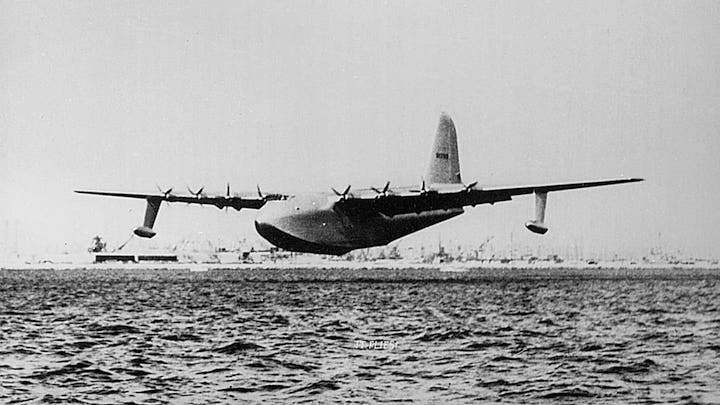 There is something uniquely obsessive in this saga that ends in November 1947, five years after the U.S. government gave the green light for Hughes to develop a massive military transport, officially designated the H-4 flying boat. On that day Hughes piloted the H-4 on its first and only flight over the harbor at Long Beach, California, in which it was airborne for only 26 seconds at a maximum altitude of 70 feet. Hughes had an intuitive feel for what would make a great airplane. Through his airline, TWA, he was a hands-on patron of the singularly most exquisite and advanced airliner of the piston-engine age, the Lockheed Constellation. But by the time he embarked on the H-4 his perfectionism had crossed the threshold into clinical madness. Picking over every detail delayed the development for so long that the H-4 was obsolete by the time it made that momentary hop over the water. Paul Allen has more money to play with than even Hughes ever dreamed of—a net worth of at least $17 billion. And he’s as passionate as Hughes about aviation. Among his expensive hobbies is a museum of vintage warplanes ranging from the World War II legend Supermarine Spitfire to the Cold War Soviet Mig 29. These days the lust for ever larger airplanes is over. There will never be another airliner as large as the Airbus A380. Its sales have slumped, dependent basically on airline, Emirates, to keep it in production. Boeing has no successor to the 747; the latest model is selling slowly and will be the last. In its place the company is about to produce the 777X, in the belief that slightly smaller twin-engine wide-body jets are the optimum in combining size with efficiency. Just exactly how much the Stratolauncher is costing Allen has not been disclosed. The list price of a new Boeing 747-8 is $380 million. Even accounting for the savings made by cannibalizing two older 747s the development costs of designing something this large from scratch to build just one machine, plus the inevitable delays and then the costs of flight testing must be pushing toward half a billion dollars at the least. Not even Allen can regard that as chump change. In some ways it is a glorious boy’s toy, something built because Allen dreamed it up and had the means to build it and because it will be a sensation when it flies. But it is also a shrewd business decision. The man who, with Bill Gates, turned personal computer software into a perpetual moneymaking machine, spotted that inner space is becoming a place for a new tech gold rush. By 2025 it is predicted that there will be a staggering 3,600 small commercial satellites. Allen is betting that many of them will make the ride there with the help of his new machine. In fact, it seems likely that, between them, Musk, Bezos, and Allen will own that market.